The annual 18′ Skiff ANZAC Championship kicks off today at the Royal Akarana Yacht Club, with the Auckland Skiff League hosting boats from the Australian fleet, as well as the loan American entrant. The regatta will get underway with two races starting at 1500 hours this afternoon and wraps up on Monday, the 101st ANZAC Day. Thurlow Fisher Lawyers (AUS) may be the defending ANZAC Champions, but local boat Yamaha (NZL) is keen to knock them off their perch. “The Thurlow lads won this last year, but they were 5th at the recent JJ’s in Australia, where we finished second,” said Yamaha skipper David McDiarmid. 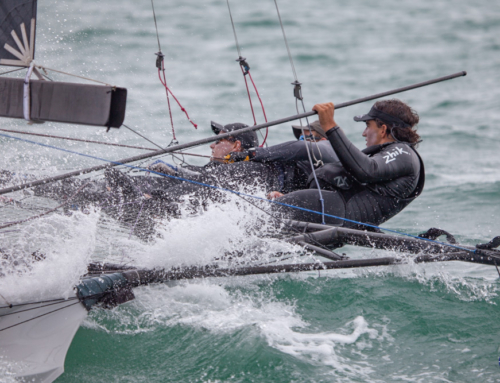 The second place was the best result by a Kiwi boat at the annual JJ’s in 42 years. “Hopefully we have the home waters advantage over them and everyone else. We are keen to have plenty of breeze with decent sends. 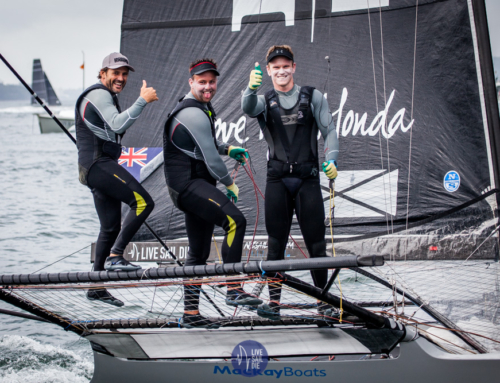 It’s awesome racing on our harbour and it’s always great to host the Aussies,” continued McDiarmid. The banter between New Zealand and Australia has begun.